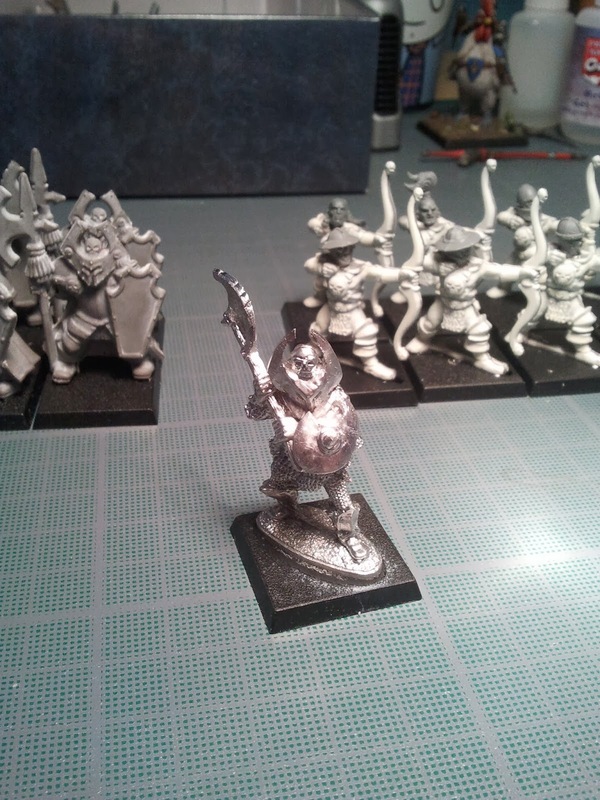 Following the Whiskey Priest's brilliant article, I decided to give a go to starting from scratch an oldhammery war band start. Let's put on a game. It can be small at first. Building to a campaign in time. The idea is all about showing what is possible without having to remortgage your house, lie to your wife about the amount of little brown packages and selling your soul. We need some blokes (if there are women out there reading this then we need you too!) to commit. We each make a warband - a tiny army - a posse, based in the Warhammer world. A maximum of 21 figures. Two units of 10 and a hero or any similar configuration. You are entirely free to do what you want! The figures must be either a) insultingly cheap from ebay or b) easily bought from current manufacturer. 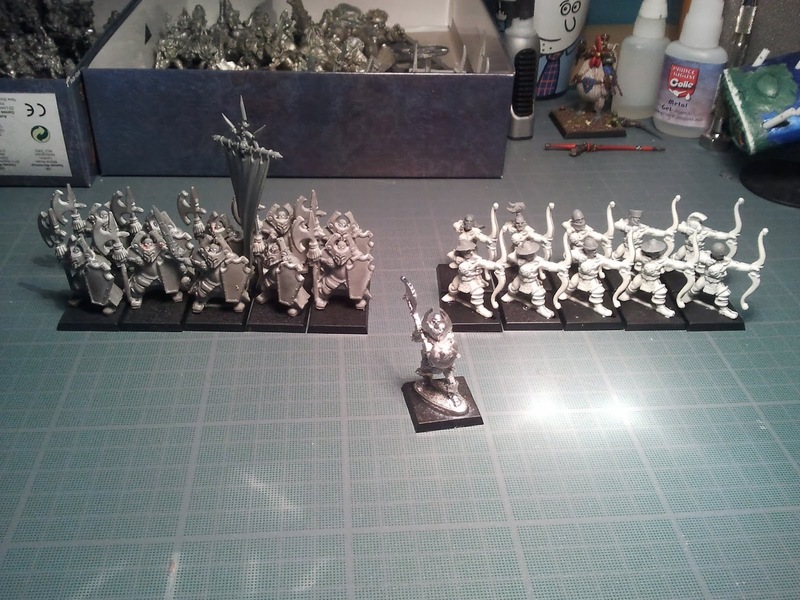 We open a thread on the Oldhammer Forum to show what we are doing, where we got our figs, WIP's and discussions of our fluff for our warbands. And then, when it's all ready!" So, 2 units of 10 and a hero? I've just happened to buy a Battlemasters complete box for 10€ (that's 8,2£ or 13,5$ to you ;) ). Considering there are about 100 models in the box, you can do the math but the price per model is the closest thing to dirt cheap I could come up with. Though the previous paintjob had a certain retro appeal. I decided to dettol it to get something new. 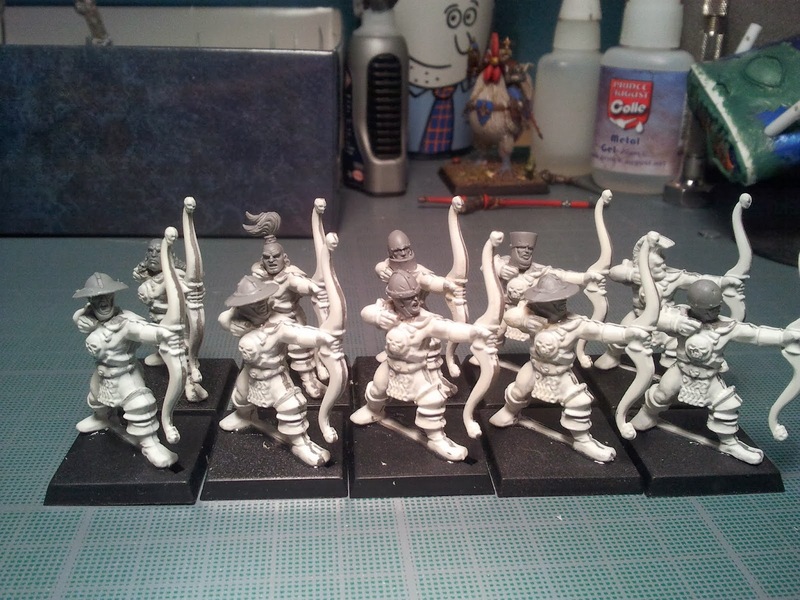 I opted for the 10 chaos wariors and the 10 archer thugs of the box. The plan here is to add these to my chaos army if I will (filling empty slots in my army list in the process). 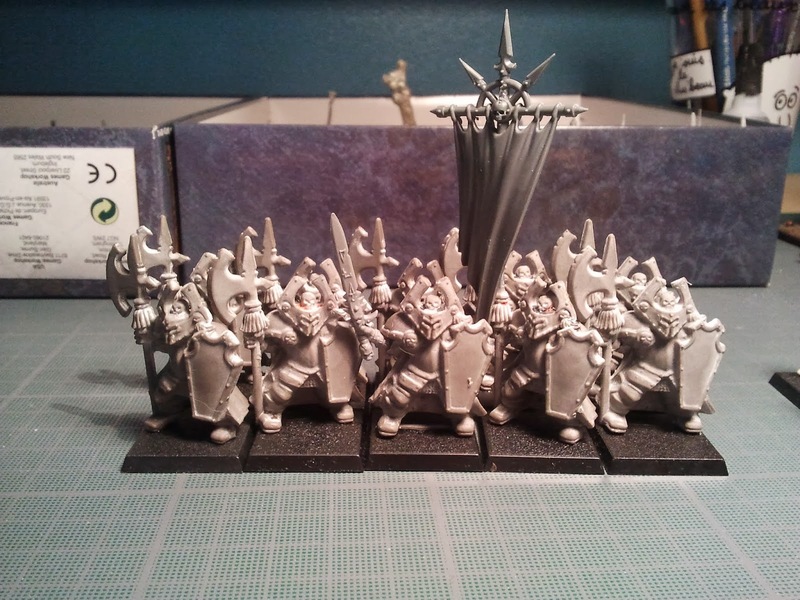 The chaos warriors haven't been converted much (just enough to get a standard bearer and champion actually) but I do plan on adding some details on the shields (following Nico's example) but nothing too time consumming. I removed the tabs of all warriors since it would have been impossble to rank them correctly. I took this opportunity to rank them on 4 different levels though being on just 2 actual ranks. I find this gives them a better depth and breaks the monotony of the "mono pose effect". The archer thugs have all been altered but one who can keep his punk crest like those of the famous marauder range. 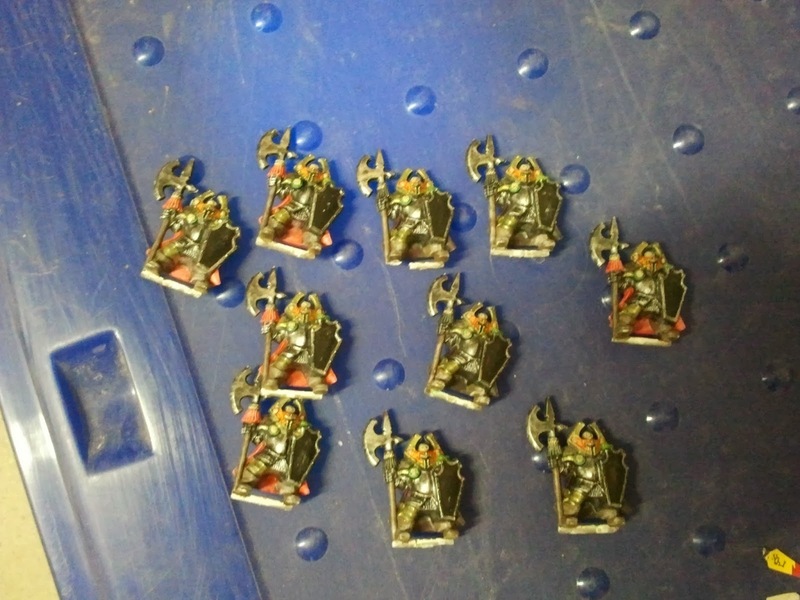 I changed the heads for some bretonnian peasants' ones because I like how they look grotesque. It somehow reminds me of early John Blanche illustrations in the "sorcery" adventure books by Steve "Fantasy God" Jackson (More pics to be found to show what I mean). Having just read some very old WD articles, I decided to use my Asgard lord of Chaos (recently bought from alternative armies with -20%) as a leader for this war band. Just look at fig 6 in page 46 HERE (or first picture above) and dare tell me Fraser Gray's sublime diorama doesn't make you salivate...). This lord looks perfect to lead the warriors since they share the same kind of design and weapons. I'll try to do my best on this model to make it stand on the tabletop. The army so far before some GS work, basing and painting. I'm looking for speedpainting here (except for the lord of course). So I'll try to come up with quick and satisfying techniques. NIce one Mr Assless, these look like the proverbial mutt's nuts. Looking for to seeing where the greenstuff leads! Well, far away and beyond ! Hey Mr. ALMan, Thank you for posting the Tabletop Heros!!! I have wanted to see this book for a long time. What pictures! Beautiful. Inspiring. Brilliant. And good luck on your warband project. Nice to see an Asgard fig in the rightful leadership spot! AAAHh Provate, such a good taste you have ! All credits due to Zhu for bringing the link on the forum. I was mad when I looked at it, it is a goldmine ! So much good pictures, so much technical help, it is brilliant. 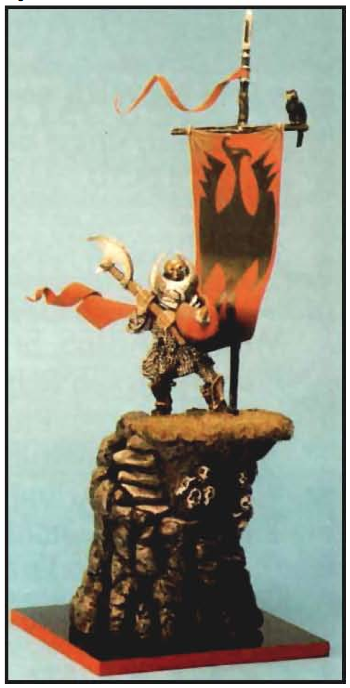 Seeing Fraser's version of the Asgard Chaos Lord I'd just bought a week before, this was a sign I couldn't ignore ! How fun! That'll be a nice little warband. Hum, you came up with a warband from nothing! 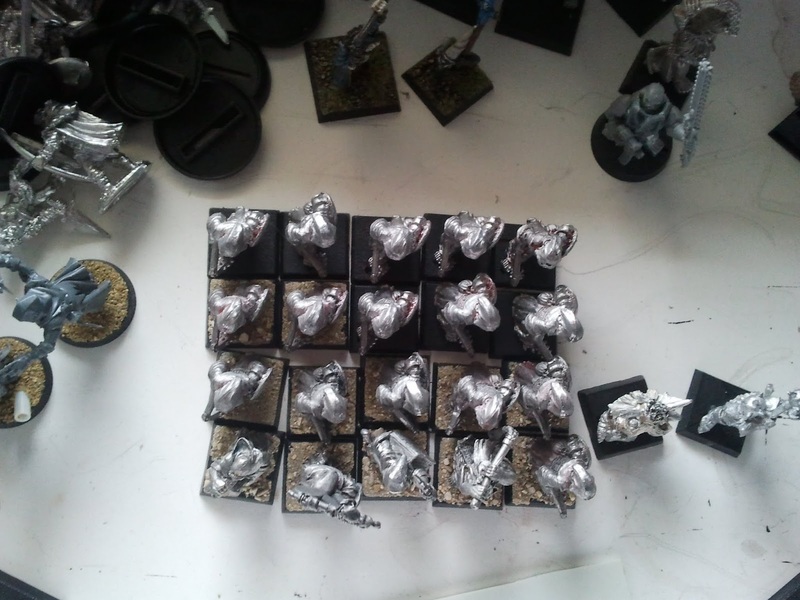 They look quite nice, they are going to be impressive when painted! Excellent idea to start a warband. I'm seriously considering bidding on a battlemasters game now. Although none are as cheap as what you got. Thanks. I kept away form ebay for this one (couldn't find my own bow at my parent's) so I bought it from a french 2nd hand site. They are definitely very good cost-effective rank fodder !